【4CH FULL HD 1080P - 4pcs Security Camera 】4 channel wireless camera & DVR system, support 4 cameras to record all day. Camera lens provides 1080p/30fps high resolution image, wide lens angle for comprehensive security monitoring and clear recording. Equipped with 10.1" TFT LCD 4 in 1 DVR integrated recorder touch screen, support HDMI video output function. 【IR Night Vision】Equipped with infrared light and infrared cutting, the WiFi camera can automatically switch to black and white night vision in the dark for 10m infrared detection, which can offers non-stop overwrite recording for 24 hours a day. 【Water-proof】Waterproof, moisture-proof, IP66 protection is the best choice for outside use. 【Persistent Surveillance Systems】iOS and Android systems are supported, enabling remote viewing of mobile phones at any time. 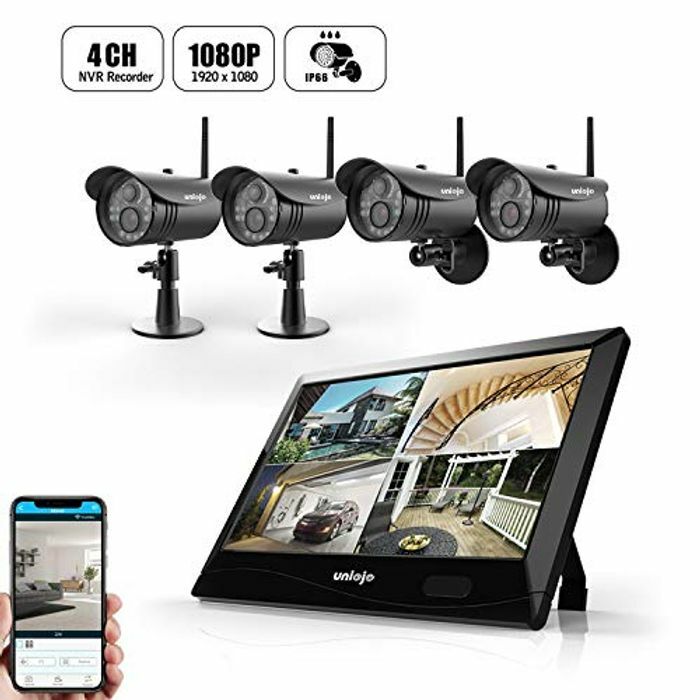 The UNIOJO wireless home security camera with motion detection function, which can detects any dynamic object and sends notifications to your phone that you will not miss every video records. * WARRANTY: Support 6 months warranty service and customer service within 24 hours: support@uniojo.com customer support!